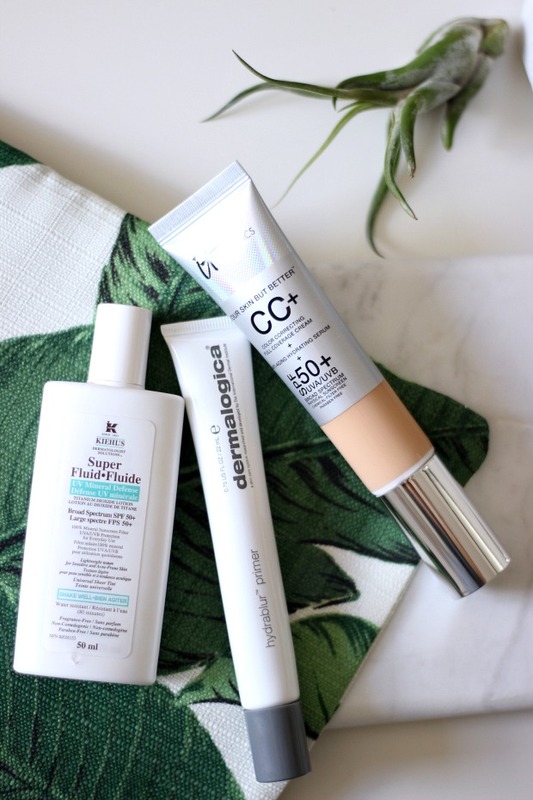 I could not be more stringent when it comes to skin protection in the summer, and facial protection is one of those things I just don't compromise on anymore. 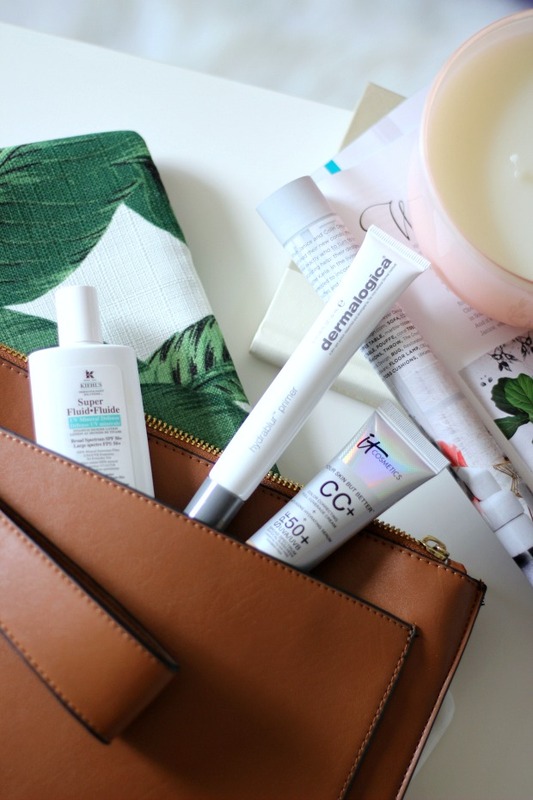 When I last discussed my skincare regime I had recently discovered I had rosacea and had totally changed up my products to more naturally and organically based. I also mentioned that I was on the hunt for an facial SPF for the summer. Since that post I have added three products to my routine and haven't looked back since. I am hooked on them all for different reasons. Two of them I wear together on laid back days and they go hand in hand-- one to protect and one to smoothen/blur any blemishes without colour. It's for the kind of days when I don't have major plans, or plan to go straight home after work and crawl into my PJS. The other product is a multi-tasking machine and is a solo application. It's for days when I want to glow and have more coverage but want to feel light, too. I wear it when I know I'm going to an event after work and want to ensure my make up will still be in tact come 6:00 PM. Here's a breakdown of exactly what they are and how I use them. Option 1: Low key days, lazy days, days spent on the beach/pool lounging. What: SPF and Primer Duo. This Kiehl's SPF is perfect for sensitive skin/rosacea. It's 100% mineral based, and is fragrance free, chemical free and paraben free. It offers brilliant sun protection and doesn't feel heavy, like it's clogging the skin. I then use the Hydrablur Primer to smoothen the look of fine lines and wrinkles. Some days I just can't be bothered for face make up and this primer still allows me to have flawless skin. The primer is so fluffy and light, it actually feels whipped! It goes on smooth and completely non-greasy. I love that it challenges any oil on my face and leaves it feeling silky smooth and mattified. I actually started using the Hydrablur in November of last year! If you think this primer looks great without make-up, wait till you see it under make-up! It's great either way. Why: For days I don't want to wear any colour on my face but still want SPF protection and skin to look unblemished. 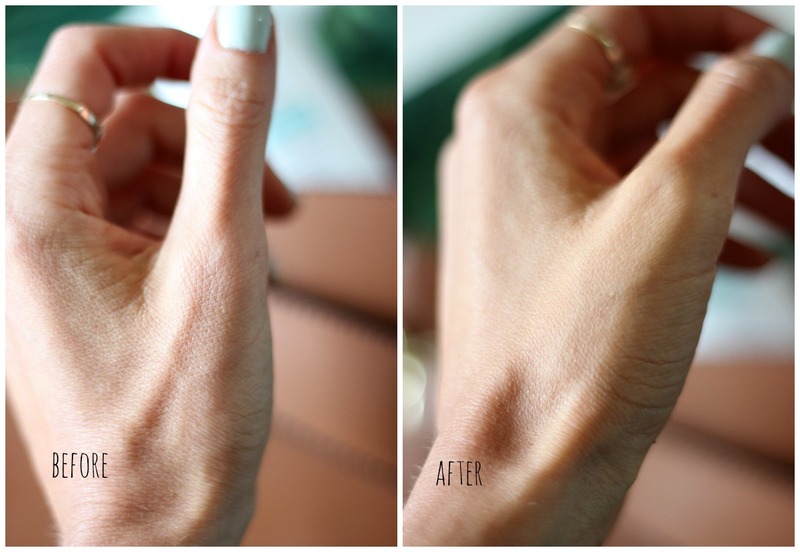 **Check out the photo below I took of my hand before and after applying the Hydrablur Primer. No photoshop was done to the photo. Focus in on the V area of my hand… V for victory!! Option 2: Everyday/evening wear for glowing coverage and SPF protection. What: Literally "It" does it all; anti aging serum, full colour correcting formula, non chemical sun protection, and reverses look of wrinkles and fine lines over time. It's also paraben free and made with vitamins A,C,B and E. This little tube is the ultimate all in one beauty cream, leaves you glowing and leaves the skin looking extremely hydrated. There's only one problem… you can't get it in Canada! Next time you're in the States, stock up on this stuff! It provides such great coverage and actually reverses signs of aging. And it' hides the look of under eye discolouration like a boss. Why: I like things to be convenient and easy. This one cream does it all and more! Do you have any summer face care secrets? What are you using to protect your skin but still look fab? Left: Before applying Dermalogica Hydrablur Primer. Right: After one application of Dermalogica Hydrablur Primer. No photoshop/editing was done to this photo. Totally smoothens the look of fine line and wrinkles! These sound like some great products! I tried that primer back in the winter and couldn't believe how well it works! The wrinkles and lines seriously disappear right before your eyes! So good. Glad you enjoyed them, Bianca! I'm definitely going to have to check out that Dermalogica primer! It looks soooooo good! Yes Kris! It is perfect for when you want to hide some blemishes but don't want to feel heavy or add colour.